Always eager to keep their sound diverse, Rancid has never been one to allow much room for anyone to pigeonhole their sound. Always bringing more and more of their influences into the picture with each release, LIFE WON'T WAIT is no exception. Bringing in more reggae, dancehall, and ska, they serve up twenty-two new tracks to complete their best album to date. 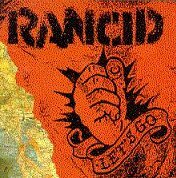 One of the most anticipated albums of 1998, Rancid's LIFE WON'T WAIT kicks off with a disclaimer warning the listeners that "...we are presenting startling facts and evidence that pick up where other explanations leave off. Some of these revelations may go against things you have been taught, and perhaps taught, all your life. Prepare yourself for the evidence that will follow." Mixed over some classic Rancid punk melodies, the words rattle around in your head as you prepare yourself for what you're about to hear. Right then they kick into the first single, "Bloodclot," a nice slice of '77 style melodic punk as only Rancid can do it. It's got enough "hey, ho's" for you to shout along with while you jump around, as well as enough strong hooks to reel you in and keep you listening. After just one listen I was humming and singing along with this number. Reaching back to LET'S GO punk beats, with ...AND OUT CAME THE WOLVES hooks, I really became attached to this song. But as the rest of the album would prove, this was not even the best track on the disc! That title is shared between two songs, one being "New Dress," another melodic track that provides head-on punk verses mixed in with the all-so-catchy chorus, complete with irresistible melody and all. 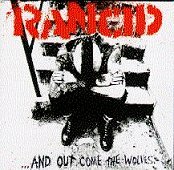 The lyrics are also solid, building on Rancid's ability to serve up potent street-stories that paint vivid pictures of the characters they are describing inside your head. Dipping into their ska side, "Hooligans" serves up a very different ska-punk style for everyone. Bringing in Neville Staples, from the Specials, as a guest vocalist, they are able to add a strong Jamaican sound while also keeping the song powerful and tough. You can easily dance to this number, or if you want, it has enough bite for you to slam dance with. But as this album progresses, so does the songs, as Rancid displays on "Crane Fist." Reaching deep into their musical purse, they bring out a ska-dub-rocksteady-hip/hop number that is sure to keep heads spinning for a long time. Proving they are able to play much more than just your standard punk, this song will have you hoppin' and trying to sing along. Lars' and Tim's voice work great on this song, as they trade off and work together to create one classy number. Probably one of the most hoppin', infectious numbers on this disc. Taking some time to mellow out a bit, "Who Would've Thought" begins off very melodic and slow. The backing vocals help add harmony, while Tim's gnarl-punk voice helps bring out a different kind of sensitivity in the words. The song then busts into some mid-tempo punk beats. From there, they take you on a melodic punk ride before hitting the chorus and really slapping you with something you can sink your teeth into. Easily sing-able, you won't be able to resist as you start to sing along with the number and have the time of your life. And as I've said before, the best track on this disc was a toss-up. The second track that deserves the title of 'best track on this disc' is the political, anti-racist number "Wrongful Suspicion." Not only is the song a trad-ska meets punk number that will definitely find you dancing, it is also a strong stand against racism and states that still wish to hang the confederate flag. One of the deepest tracks on this disc, it really hits home no matter where you live. With a very melodic, flawless number like this, listeners will have no problem interpreting the message and feeling the angst Tim and company had while writing this song. Ending with "Coppers," a rocksteady-punk-ska number, the CD ends with yet another strong cut. Twenty one great tracks, and not one dud, you don't come across that every day. The guests alone make this disc a stand out. Such guests include Greg Lee and Alex Dessert from Hepcat, Dave Hillyard, Vic Ruggiero, Buju Banton, Dicky Barrett, and Eric Stefani (No Doubt Founder). However, Rancid proves that these extra-special guests are no support system, rather just friends they brought in and had fun with. After waiting for the past two and a half years for a new album, Rancid fans will be delightfully pleased with this, as will new Rancid fans. I'll give this album an A+.